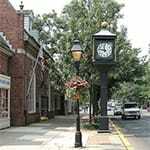 There are lots of reasons to visit Downtown Haddonfield. 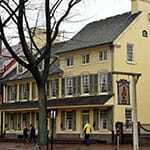 Besides all of the great opportunities to shop and dine, we are known for the historical, cultural, architectural and just plain interesting and fun places that the whole family will enjoy. Click the titles for more information about each item. 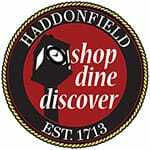 14 fabulous videos about Downtown Haddonfield! Researched and filmed by CBS Philly. 233 Kings Highway East This more than 270 year-old historic building is New Jersey’s first state-owned historic site (1903). 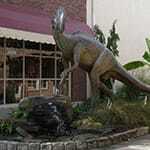 John Giannotti’s Hadrosaurus foulkii sculpture in Haddy Lane is now the central landmark of downtown Haddonfield. 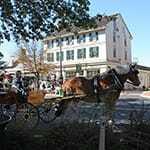 Kings Highway was originally a wagon trail named in honor of the British monarchs that once ruled the area. 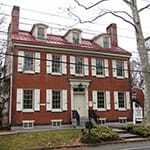 This 1777 building is home to several retail enterprises, apartments and business offices. It’s newest tenant, Kings Road Craft Brewery, is open for business! 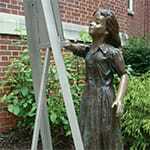 Take a walk around town to experience the pleasure and variety of our sculptural artwork. Open every Sat. from 8:30am to 1pm, May 20-Oct. 28 in Kings Court. 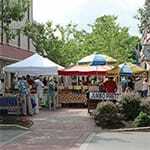 The market is opening for it’s 11th year. 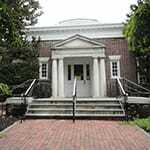 Established in 1808, one of the oldest libraries in NJ, recently renovated preserving it’s historic significance. 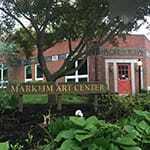 Since 1956, Markeim has been promoting the creation and enjoyment of visual arts through exhibits and education. There is a diverse choice of restaurant options in town. 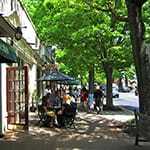 Wide sidewalks make room for scenic outdoor dining. 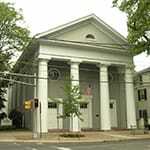 Home of the Historical Society of Haddonfield, and former home of the Gill family, was built in 1841. The building is open to the public. A self-guided interpretive looped tree trail, on a wooded and hilly terrain, leads around the pond near Grove Street & Hopkins Ave.
An old fashioned band stand, benches, trees….The heart of the downtown. Relax, enjoy an event or celebrate a holiday. 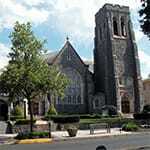 One of many beautiful churches in town, 1st Presbyterian, boasts original Tiffany stained glass windows. 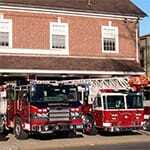 Founded in 1764, Haddon Fire Company remains the second oldest volunteer fire company in continuous existence in the US. 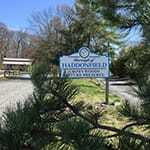 About 50 acres of mature undeveloped forest in a park with ball fields and mowed lawn and a community garden. 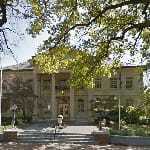 The home of Haddonfield government, is located at 242 King’s Highway East and was built in 1928 by Walter William Sharpley. 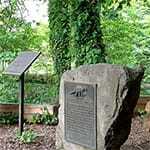 Off Maple Ave, this site is where the first relatively complete set of dinosaur bones were discovered in 1838. Originally built in 1857 as a church, it became a meeting place a woman’s civic and social club in 1911 and is on the Register for National Historic Places. 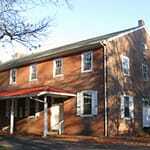 This building was erected in 1827 but the Quakers had a huge presence in the area since 1715.